Flight time 11hrs from London. 18hrs from L.A. Looking to discover a new destination with a little-added luxury? 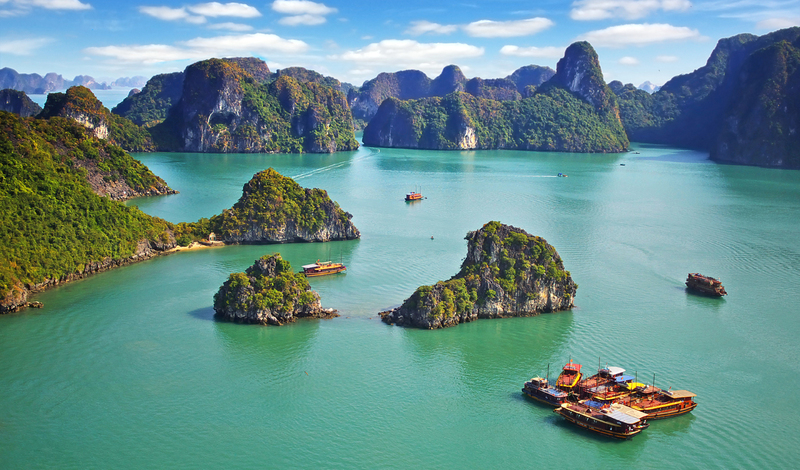 Then let us introduce you to Vietnam: a land of jungles, beaches and incredible natural beauty on the South China Sea. From the ancient monuments of Hanoi to the dreamlike waters of Nha Trang, we’ve created the perfect trip, taking you from top to tail to experience this understated gem the Black Tomato way. Touchdown in Vietnam’s buzzing capital, Hanoi, where we’ll whisk you off to the Sofitel Legend Metropole for some serious R ‘n’ R. But if you’re itching to explore this monument-riddled city? We’ll arrange a chauffeur-driven vintage classic just for you. Take in the sights before stopping off at the magical Hoan Kiem Lake to marvel at a traditional performance of the famous Vietnamese water puppets. In the mood for a truly local take on this great city? Ask anyone in Hanoi, and they’ll tell you the only way to slow up the pace and see the city like a local is by cyclo. Together with a private guide, you’ll head into the Old Quarter, squeezing through a maze of narrow streets bursting with everything from booksellers to banana traders. Next up, our local expert will take you for a trip through Chau Long market, after which you’ll try your hand at preparing some traditional Vietnamese dishes yourself. Still wanting more? We’ll arrange a half day street food tour with Daniel Hoyer, an American chef, culinary instructor and food writer extraordinaire who will give you an overview of local ingredients by visiting a local food market and tasting Hanoian specialities such as Pho Cuon, a grilled beef and rice noodle roll. Following on from your taste of the capital, you’ll head east to the enchanting waters of Halong Bay for a truly memorable trip on your private junk boat. Gliding across the emerald waters, you’ll be amazed by the myriad of limestone islands and islets, beautiful beaches, fishing villages and mystical grottoes. We’ve seen some amazing places in our time, but this UNESCO World Heritage Site is truly unique. The private junk is a great way to explore the water, but for an exceptional take on this place, take to the skies and do Halong by heli. Now that’s what we call a view. Take to the waters and explore secluded bays and drop anchor where you can kayak and venture deep into the caves and grottoes. After a night in imperial Hue, taking in years of rich history, it’s time to take to the sky. 500 metres above sea level, Hai Van (ocean cloud) Pass is a picturesque perch from which to take in the South China Sea and the Annamese Mountains. Your challenge, if you choose to accept it, is to cycle via the Pass to Hoi An – your next port of call. The harbour town of Hoi An is awash with a great mix of culture and natural beauty. There’s no better way to get to know a place than with some local expert help. With that in mind, we’ve organised a tip-top guide to enlighten you to the ways of the local farmers and fishermen – a personal experience that will stay with you forever. In great company, wind your way through emerald green paddy fields, plant local vegetables and explore coconut palmed waterways from a bamboo basket boat. Staying at the Four Seasons Nam Hai (one of our Vietnamese favourites) you’ll have time to explore the incredible culture and must-see spots of these beautiful surroundings, whilst also doing some serious relaxing. Oh, and you can’t help but notice the food. So allow us to introduce you to a passionate and extremely talented chef with in-depth knowledge on Hoi An’s food scene. They’ll take you on a culinary journey embracing a combination of refreshing flavours and beautiful presentation, as well as taking you on a visit to Hoi An Market to meet their favourite vendors. Don’t worry, there will, of course, be plenty of opportunities to sample Vietnam’s culinary masterpieces. After Hoi An, carry onto Ho Chi Minh, where there’s only one way to get around the bustling streets – a vintage Vespa. 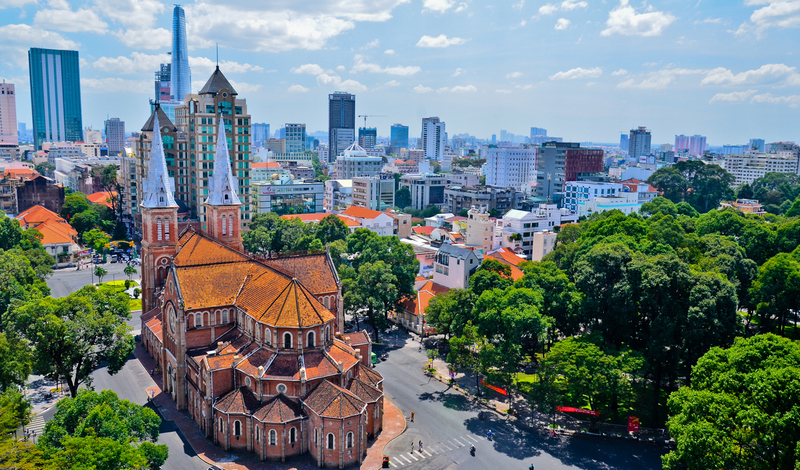 Whizz through the city in the company of our expert drivers and guides, taking in the exceptional mix of ancient Vietnamese and French colonial culture on view. Next up, a restored army Jeep will take you to one of Vietnam’s most unique sites – the Cu Chi tunnels. No trip to Vietnam would be complete without stepping back into history, so we’ve arranged an exclusive tour of this labyrinthine network just for you. For a full picture of Vietnam’s past, you’ll also stop by the War Remnants Museum which offers powerful insight into the Vietnamese War years. Check in at the Park Hyatt for the night before heading south west for a couple of hours, taking in the lush rice paddies and fruit farms, before emerging in Cai Lay where you can stretch your legs a bit and hop on a bicycle for a short ride along narrow village lanes, passing by fruit orchards and local cottage industries. Locals will often greet you with a hello or “xin chao” as you pedal by. A culinary adventure will then take you through the busy Ben Thanh Market, considered by many to be the heart of Ho Chi Minh City. A chef will be on hand to guide you through the variety of exotic ingredients, before heading to the Mai Home cooking class for a hands-on cooking lesson, where you will learn to cook delicious traditional Vietnamese dishes. Wake up early (Good morning… you know the rest…) and get a unique taste of life in the Mekong. Board a local boat and explore the colourful Cai Rang floating market, where hundreds of boats laden with fruit, vegetables and fish jostle for trade. Sellers advertise their wares by crying out across the waters or by tying their goods to tall poles attached to their boat so that buyers can see from a distance what is being sold. From there, you’ll catch a flight to Con Dao to arrive at the beautiful Six Senses. In the heart of the spectacular Con Dao archipelago of islands, Six Senses Con Dao rests on the shores of 1.6 km of sandy beach, surrounded by dramatic mountain landscapes. Enjoy the incredible beaches as you relax into a beautiful ending to this incredible Vietnamese adventure.